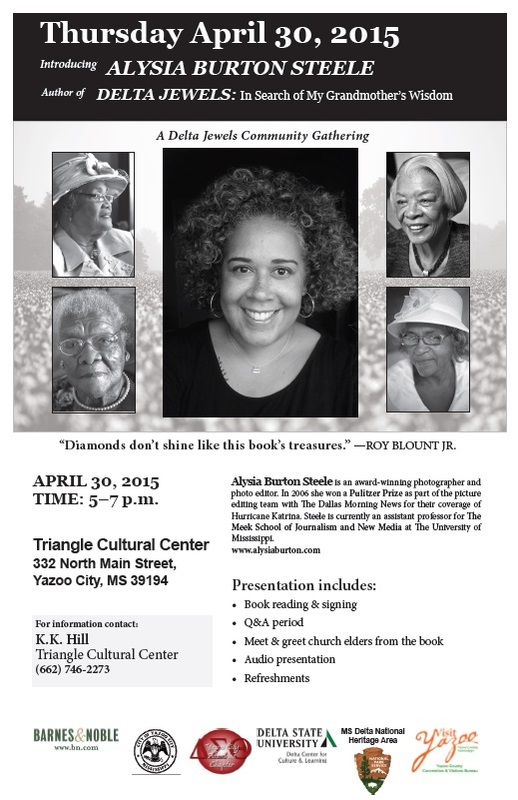 Award-winning photographer and photo editor Alysia Burton Steele will be in Yazoo City on Thursday, April 30, 2015, for a presentation of her book Delta Jewels: In Search of My Grandmother’s Wisdom from 5 pm to 7 pm. Ms. Steele is the author of the forthcoming book, Delta Jewels: In Search of My Grandmother’s Wisdom, which is a collection of photographs of and oral histories about African American church mothers from the Mississippi Delta. The book is scheduled for international release on April 7. For more information, visit http://www.alysiaburton.com/ and https://www.facebook.com/deltajewelswisdom.